I'm very uninitiated when it comes to Constantine though I have read a bit of him here and there. This volume starts off wherever presumably Constantine was left in his last series. He now returns back to London and gets involved with Mercury and Swamp Thing looking for the missing Arcane of Rot. That story merges with another as a powerful Djinn takes control of London's Underworld. I love Swamp Thing and absolutely loved that storyline the best! The two stories run side by side until the end where we leave Swamp Thing and Constantine and Mercury take off together. 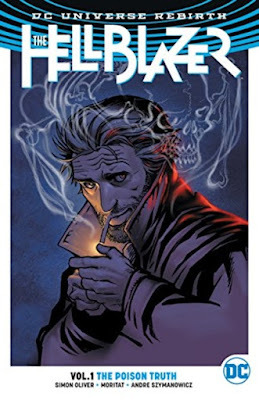 So far I'm not a big fan of Constantine himself, but I did enjoy this plot and am interested in seeing where it goes. There is a tiny cross-over when Wonder Woman and Shazam show up for a page which is always fun. However, I did not like the art at all. It is very cartoony and didn't fit the mood the book otherwise assumes. For example, Wonder Woman looked, to me, like an anime teenager in cosplay.